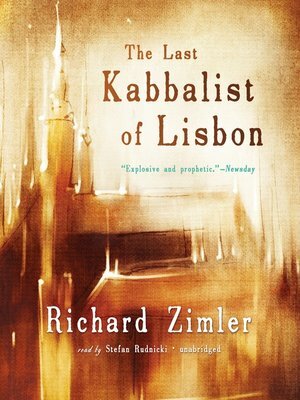 The Last Kabbalist of Lisbon, an international bestseller, is an extraordinary novel that transports listeners into the universe of Jewish Kabbalah during the Lisbon massacre of April 1506. Just a few years earlier, Jews living in Portugal were dragged to the baptismal font and forced to convert to Christianity. Many of these "New Christians" persevered in their Jewish prayers and rituals in secret and at great risk; the hidden, arcane practices of the kabbalists, a mystical sect of Jews, continued as well. One such secret Jew was Berekiah Zarco, an intelligent young manuscript illuminator. Inflamed by love and revenge, he searches, in the crucible of the raging pogrom, for the killer of his beloved uncle Abraham, a renowned kabbalist and manuscript illuminator, discovered murdered in a hidden synagogue along with a young girl in dishabille. Risking his life in streets seething with mayhem, Berekiah tracks down answers among Christians, New Christians, Jews, and the fellow kabbalists of his uncle, whose secret language and codes by turns light and obscure the way to the truth he seeks. A marvelous story, a challenging mystery, and a telling tale of the evils of intolerance, The Last Kabbalist of Lisbon both compels and entertains.